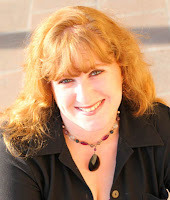 Last month, I shared about Buffalo Bill Cody and his famous Wild West Show. If you missed that post, you can read it here: https://www.hhhistory.com/2018/05/buffalo-bill-vaudeville.html. Today, I'm focusing a bit on our amazing military here in the US and paying tribute to the 116th anniversary of the US Military Academy at West Point. I live surrounded by five (5) military installations here in Colorado Springs: Fort Carson (army), NORAD, Peterson Air Force Base, Schriever Air Force Base, US Air Force Academy. Even though I'm not military, I am immersed in the military world. With the recent graduation season and our celebration of Memorial Day, I thought it fitting to honor the oldest established military installation in the country. West Point: U.S. Military Academy (USMA)! depicted here are now gone. The history of the United States Military Academy can be traced to buildings constructed on the West Point of the Hudson River during the American Revolutionary War in 1778. I featured this general area in my second book, Quills & Promises, which took place during the French & Indian War. 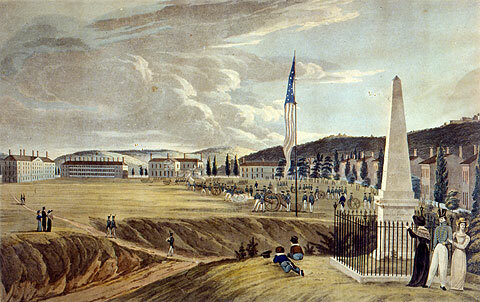 Following the Revolutionary War, President Thomas Jefferson signed legislation establishing the United States Military Academy (USMA) on that very site in 1802. The Connecticut militia first occupied West Point on January 27, 1778, making it the longest continually occupied post in the United States. The Continental Army occupied the land for twelve years until Secretary of the Treasury Alexander Hamilton authorized the purchase of the land for $11,085 in 1790. It was as commander of the fortifications at West Point that Benedict Arnold committed his infamous act of treason when he attempted to sell the fort to the British. George Washington realized a need for a national military academy to teach the art and science of war, but his Secretary of State Thomas Jefferson argued there was no provision in the Constitution that allowed for such a thing. 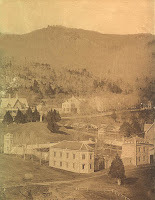 Many in the Congress also feared establishing a Military Academy as too aristocratic. American military failures in frontier-fighting motivated Congress to improve the instruction at West Point, but little resulted due to a lack of qualified instructors. By the time John Adams left office in 1801, the Corps consisted of only twelve cadets and one instructor. Despite his earlier misgivings, when Jefferson became president, he called for and signed legislation establishing a "Corps of Engineers" which "shall be stationed at West Point and constitute a Military Academy" on June 9, 1802. The early years of the academy were a tumultuous time, with few standards for admission or length of study. Cadets ranged in age from 10 to 37 and attended between 6 months to 6 years. In 1817, Sylvanus Thayer became the Superintendent of the Academy. He is known as the "Father of the Military Academy." He upgraded academic standards, instilled military discipline, and emphasized honorable conduct. He also created a teaching method known today as the Thayer Method, which emphasizes self study and daily homework, as well as small class size. This method of instruction is still used today. For the first half century, USMA graduates were largely responsible for the construction of the bulk of the nation's initial railway lines, bridges, harbors and roads. This tradition continues today in the hands of the U.S. Army Corps of Engineers. Although no graduate of the Academy has made general officer rank at the start of the War with Mexico, by the time of the Civil War, nearly every general officer of note from either side was a graduate of West Point. Some famous graduates of the Academy are: Robert E. Lee (1829), Ulysses S. Grant (), Willard Young (1875), George Washington Goethals (1880), John J. Pershin (1886), Douglas MacArthur (1903), Joseph Stilwell (1904), Henry "Hap" Arnold (1907), George S. Patton (1909), Dwight D. Eisenhower & Omar Bradley (both 1915). 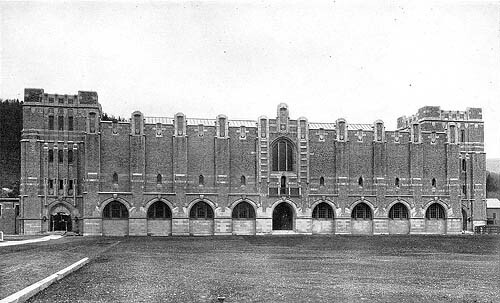 Although the challenge of wars and changing education in America caused West Point to struggle at times, the Academy managed to rise above by adapting its curriculum to include a greater emphasis on history and humanities, and by expanding its infrastructure on the grounds, tearing down most of the old buildings and rebuilding. By 1933, the title of Bachelor of Science was given to all graduates. Following the creation of the U.S. Air Force as a separate service in 1947 and until the graduation of the first United States Air Force Academy class in 1959, West Point cadets who met the eligibility standards could apply to be commissioned as Air Force officers. 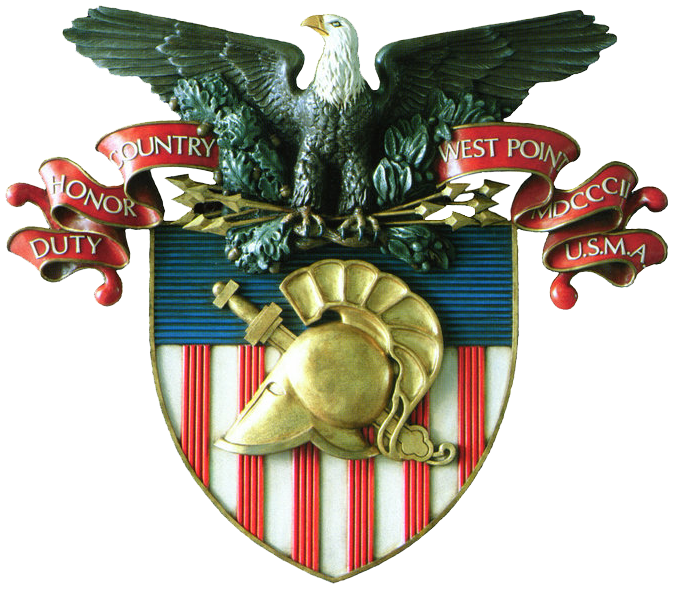 To this day, West Point remains one of the most prestigious military academies in the United States. I have no doubt this will continue. 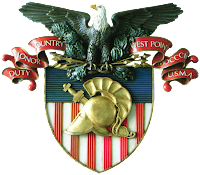 * Do you know anyone who has attended and/or graduated from West Point? * Has anyone in your family ever served in any branch of the military at any time? Which branch and when did they serve? * Have you ever attended an Army/Navy game, the biggest sports rivalry in the military? I do have many family members who were in the service. Sadly I can't name off all of them, nor which branch of service they served. My generation of the family boasted at least four Marines. One lost his life in Vietnam, two others served there as well, and one who was younger became a recruiter. Connie, that's understandable. There was a time in our country where everyone had a family member in the military. Now, it's more like you encounter those who are serving but they might not be in your family. I currently only have my nephew serving as a Marine right now. Beyond him, it's all the older generations who have the service records. I don't know anyone who attended or graduated from West Point. Myself, my brothers and my father all served in the Army. I've never been to or seen an Army/Navy game; not a big sports fan. Finally, I find it interesting the Benedict Arnold tried to sell West Point. Kinda hard to get away with that. As for Benedict Arnold, I know. Acts of treason are often quite surprising. His unfortunately gave his name a bad taste in everyone's mouth when it's spoken. Hi Amber: I have several male family members who served in the US military and a grandfather who served in the British Marines in WWI. My father and his brother served in US Army in WWII, my brother in Army in Viet Nam, also my husband in Marines in Viet Nam. I did a lot of research on USMA, West Point for my current series: Officers of the 7th Cavalry. Lt. Col. George A. Custer was an 1861 graduate of the Academy. Later when George was given command of the 7th, most of his officers were graduates of West Point. Because of that research, I understood more about the Civil War and why the south lasted so long in the conflict. Officers north and south were graduates of the Academy, so they had the same training and often were fellow graduates and knew the strengths and weaknesses of their opponents. I enjoyed your article. Thank you for sharing. Diane, that's a lot of family members, and it's fairly typical for that time in our country, courtesy of the draft. However, that's a strong legacy of service in your family too! I discovered the same thing about the officers during the Civil War. Nearly every ranking officer was a graduate of West Point at that time, so the saying of "brother vs. brother" really hit close to home and was very true. I do not know anyone personally who graduated from West Point. I had an uncle who served overseas during WWII and a cousin served in Vietnam. Thank you for this great history lesson. My pleasure, Marilyn. I only know 1 person right who just graduated from West Point. That's what spurred my choice of topic for this month. Before that, I only heard about the prestigious academy.